CURRENT SPACE: The owners had a good quality lounge suite, which was not bought to its full potential given the very boring living room. The room was very small, and dark, with only one small bay window on the eastern side. There were no architectural features to the room, and the budget didn’t allow for any structural changes. CLIENT BRIEF: The client’s house was a cute older cottage, so they wanted to create a classic style living space, with a formal feel, that was a little retro. They had tried in vain with various cushions and rugs, and bringing other furniture in the room to try to get the feeling that they wanted, but just couldn’t pull it all together. The husband, to his wife’s dismay also wanted a bar. 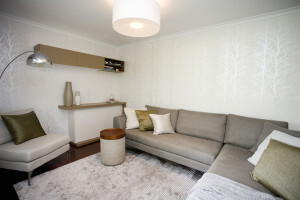 COMPLETED SPACE: The room was transformed into a classic soft feeling living space. A monochrome pallet was used, with a light warm grey on the walls to reflect any light. We used luminous wallpaper on two adjoining walls, making the space feel larger, and a silk rug that also had a slight sheen, to create the illusion of bounced light. 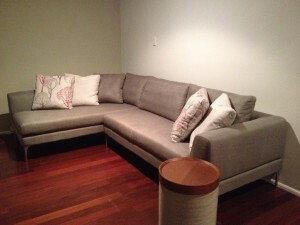 I suggested turning the chase section of the couch to create a feeling of a more intimate room. Retro inspired cabinets were installed in a modern way, which contained the husbands on the wish list, full (hidden) bar!